Guernsey No. 48 (2001 - 2002). Doering was a left-footed back pocket / back flanker famous for zoning off on his own opponent and providing drive to the forward line. In 18 games for Carlton over 2001-2002, Doering was a useful flanker who could find the ball. Originally on the Essendon list, he was a member of Essendon's reserves premiership team in 1999 before being picked up by the Blues in the Rookie Draft in 1999. Doering originally played with Sandhurst, and then played for the Bendigo Pioneers in the TAC Cup and while he was playing in the TAC he played 4 games with the Carlton Reserves as a top up player in 1997. 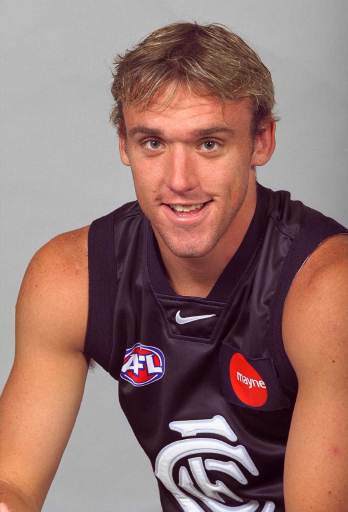 After spending all of 2000 as a rookie in the VFL, Doering was promoted to the main list in 2001 and played 7 games with minimal game time, averaging about 8 possessions and 1 mark a game. But in 2002 Doering would receive more opportunities as the Blues suffered a spate of injuries to senior players and fell dramatically down the ladder. He was again promoted from the rookie list and would play 11 of the last 12 games - in all of which he was named on the interchange bench. Neverthless he was still able to average a commendable 15.1 possessions and 3.6 marks per game, placing him in the top 10 at the club. He also kicked 7 goals, including decisive ones late in two of our rare winning games in 2002, against Richmond and the Western Bulldogs. Unfortunately with Carlton winning the wooden spoon that year, some tough decisions were made and Doering was not retained for 2003. Doering would have one of the more distinctive kicking actions of the past decade, with a significant hunch back over his passing in much the same way some old golfers putt for greater accuracy. Incidently, he is the games record holder at Carlton for the No.48 guernsey. His tally of 18 games easily eclipses that of Ashley Matthews who played 7 games in this number. He played a total of 50 Reserve games with with Carlton and scored 53 reserve games. After being delisted, Doering played for VFL club's Tassie Tigers (2003) and Bendigo Bombers, QLD club Labrador, and in 2010 lined up for EDFL club Strathmore being coached by Ex-Blue Digby Morrell. In 2003 whilst playing with the Tasmanian side, him and his team-mate and former Blues reserves player Cameron Blight were named in the VFL's team of the year. Contributors to this page: molsey , Bombasheldon , WillowBlue , tmd1 , BlueWorld , true_blue24 , PatsFitztrick , Jarusa and admin . Page last modified on Saturday 15 of February, 2014 21:15:29 AEDT by molsey. 2002 - Blues grand plan to reduce debt (14/12/02).